Expanding Vermeer's 1660 painting "The View of Delft" into a 3D Virtual Reality flight over Delft and a QuickTime "Walk Through Drawings of The View of Delft Area"
Lecture and Computer Demonstration presented during the CIHA conference, London, September 5, 2000. Johannes Vermeer's famous painting "The View of Delft" (1660-1663) in the Mauritshuis, The Hague is currently the subject of two QuickTime movies. These are movies which can be transported on Internet, and viewed on a computer. The first is a 3D Virtual Reality flight over Delft 1660 and the second is A walk through drawings of the gates shown in Vermeer's 'View of Delft'. As a new and exciting experience these movies are didactically oriented towards both art historians as well as those who hardly ever visit an art museum. 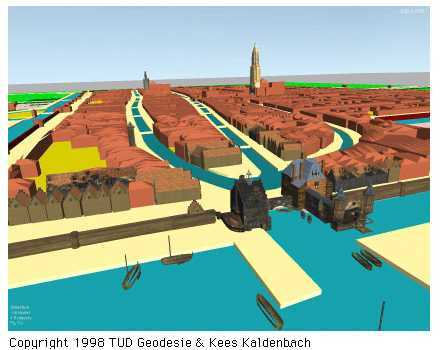 Inspired by his long topographical study of the area of the painting, in 1997 the author initiated a virtual reality (vr) 3D flight over the Delft of 1660. This was carried out by the Delft University of Technology (TUD) who had built the necessary software for the vr flight with 'Karma'. Karma was created by two TUD faculties; the Geodesy sub-faculty in collaboration with Technical Mathematics and Informatics. For this project a 1650/1660s map of Delft was digitized. 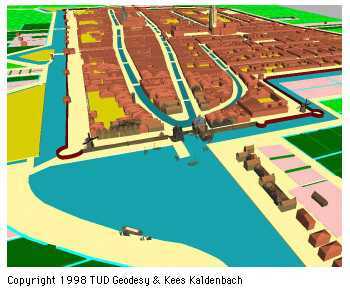 Then the resulting data set was coded and worked into a virtual 3D model of Delft as it must have once looked from a distance. Due to the powerful Karma software, viewers can actually view a real time free-flight over this model; either on a computer screen or projected by video onto a large wall. The technology behind the 3D effect requires some explanation. The software generates two nearly simultaneous images; one as seen with the left eye from coordinate point x-y-z and the other as seen by the right eye from some 10 to 20 centimeters immediately to the right of this point. Both images are then produced very rapidly in succession on the same screen at a rate of about 30 times a second. Special electronic eyeglasses make it possible to quickly block and free the viewing eye from the left eye to the right one at the same frequency. Thanks to the adaptative power of the human eye, the wonderful impression of spatial 3D occurs. The Geodesy sub-faculty was able and willing to execute this project to showcase their technological abilities. The first flight was achieved in November 1997, and the result subsequently exhibited in the Delft Technical Museum. An interview with the team of producers was shown on a local television network at that time. In 2000 a small QuickTime version of the flight will be produced showing one fixed-path flight over Delft. This video movie is available on the internet in 2001. The 3D effect will not be available as the necessary software and special glasses required are not widely distributed. For more technical detail discussed in English, Dutch, German and French and a story about Vermeer's painting see the author's home page. Another project initiated by the author is a Quick-time movie showing a walk through the gates of Vermeer's Delft in 1660. It is currently being produced by the Industrial Design Department of the OCP faculty (Design Engineering and Production) of the Delft University of Technology (TUD). Since 1975 the author has collected a large number of views (photographs, paintings, drawings, engravings) of the area depicted by Vermeer in his "View of Delft". In May 2000 this project began by scanning selected images from the Delft Archives, which graciously gave their full cooperation. These basic images were then manipulated with Canoma., a commercially available software package which allows any photograph of a spatial object to be quickly (but imperfectly) translated into a spatial scene. Objects within the scene must then be identified and tagged as rectangles, cones, spheres etc. After this tagging is finished one is able to take a virtual camera through the resulting electronic image, going forward, up, down, left or right, into any desired direction. A succession of these images generated by Canoma can then be spliced and electronically fused into a continuous walk through the ancient town gates of Delft as they appeared in the 17th and 18th centuries. This area in the south of Delft where tow boats (an early form of public transportation) once docked, has been sketched, drawn and engraved by many artists throughout the ages. So many examples have been kept for posterity that a true-to-life virtual reality recreation of the physical site is possible. Because so many images were available it has become possible to create a continuous virtual walk from the outer edge of town, via the Rotterdam Gate (see image to the left - it is the gate on the right hand side of the Vermeer painting) onto the bridge where one can see a wide arc of the town from within. In 2001 results will be available for viewing on the author's home page. Both these QuickTime movies could one day also be used for other purposes, as part of a CD-rom or vr program or in a television program focusing on the multitude of artists, artisans and patrons living in 17th century Delft. Part of this project will be a clickable map showing the location of the addresses of some 70 artists and 70 patrons in 17th century Delft located by the present author. This research is also presented in the 2001 exhibition Vermeer and the Delft School in the Metropolitan Museum of Art, NYC and the National Gallery, London. John Michael Montias, the foremost authority on the subject of artists and artisans in 17th century Delft and who has published widely on the subject, has kindly agreed to the use of his findings in future projects. As one of the highlights of Western painting the subject of the 'View of Delft' is a particularly suitable subject. Although only vestiges of its former grandeur are now visible at the actual site, 21st century technology enables us to show a moving virtual reality image of Delft as it was in 1660. Images may help in temporarily bridging the gap between a youthful image-oriented pop culture public and those in the field of fine arts and art history. Note on a personal quest. My fascination with Johannes Vermeer's paintings dates from my stunned reaction to his grand canvas "The Art of Painting" when I visited Vienna in 1975. Reading such books as Albert Blankert's wonderful 1975 Vermeer biography I became aware that no in-depth research had been done as to the topographic reality of a 'View of Delft'. This set me on a quest which has not yet ended. Vermeer paintings fascinates me on at least three levels, as an image with "near vr qualities", as a source of enigma within the art of storytelling and as tangible paintings, wonderfully and near magically crafted layers of paint on canvas. Drs. Kees Kaldenbach, Amsterdam, September 2000. Drs. Kees Kaldenbach originally trained as a teacher and is currently an independent art historian in Amsterdam, Holland. A member of AHWA, he is Co-chair of the AHWA Digital Teaching Committee. He is also member of the Association for Art History and of the International Society For Mathematical And Computational Aesthetics and a contributor of the Dutch Ars et Mathesis Foundation. In 2001 a QT film of this flight will be presented. Stay tuned.